Use the form below to contact tour Turkish Marbling - Ebru Course Certificate Programme 6 Days Marbling - Ebru Class - Sultanahmet / English Tutoring directly. 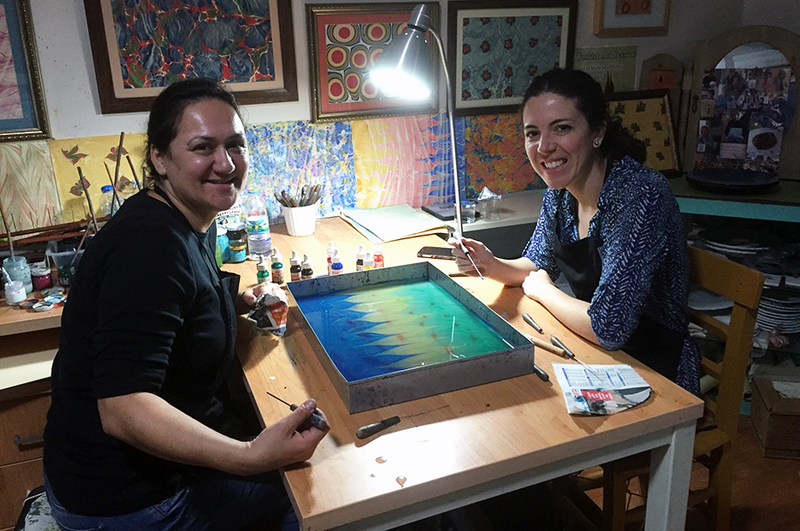 Learn about the techniques of the traditional Ebru Art from out teachers in the center of istanbul – Sultanahmet. Spend a week in istanbul learning the art of Marbling. The aim of this course is to teach the history and the application techniques of Turkish Ebru Art; the paints, equipment used in Turkish Ebru Art and the kinds of ebru. Meeting in our Art studio with our Teacher Ms. Bahar. 11:00 – 13:00 – Introduction to Ebru Art. 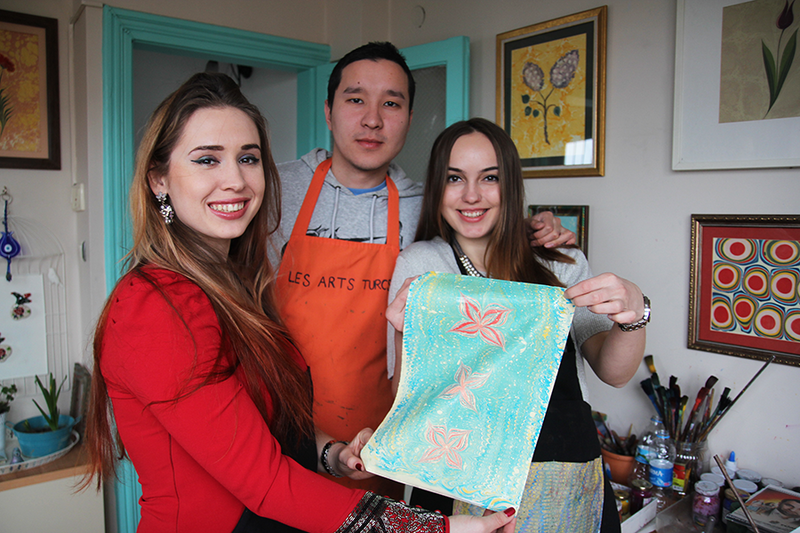 11:00 – 13:00 – Ebru Art Class – Preparation of the Materials. 11:00 – 13:00 – Ebru Art Class – Traditional techniques and transfering on paper. 11:00 – 14:00 – Visiting workshops, exhibitions and art material suppliers. 11:00 – 13:00 -Ebru Art Class – Advanced techiques and experimental works. Upon request, we can provide you 3-4 stars quality hotel or furnished flat near our workshop located in the center of Sultanahmet. We can make this certificate programmes all year long. We have flexibility on times and course duration. We also give a course attendance certificate for our students signed from our teachers. If you plan to visit as a group, please get in touch with us to give you discounted group prices. Marbled paper, called ebru in Turkish, was used extensively in the binding of books and within the calligraphic panels in Turkey. The existing word ebre in Eastern Turkish, meaning variegated, points to the fact that marbling might have been known by the populations of Central Asia. Its origin might ultimately hark back to China, where a document from the T’ang dynasty (618-907) mentions a process of coloring paper on water with five hues. In the early examples from the 16th c. in the Ottoman-Turkish era, ebru appears in the battal (stone) form, namely without any manipulation. Interestingly, several variations developed in time, giving us types such as gelgit, tarakli, hatip, bülbül yuvasi, çiçekli (respectively come-and-go, combed, preacher, nightingale’s nest, flowered, etc.) An attempt has been made here to show some of its principal patterns, with samples by the master marblers of this century chosen from our collection. 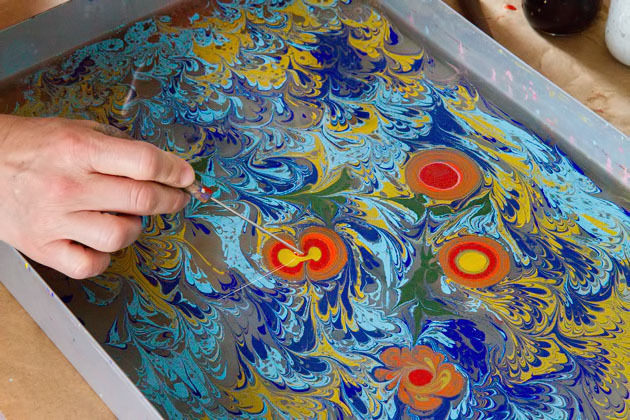 Ebru technique consists of sprinkling colours containing a few drops of ox-gall on to the surface of the bath sized with kitre (gum tragacanth) in a trough. By carefully laying the paper over the bath, the floating picture on top of it is readily transferred to the paper; thus, each ebru is a one of a kind print. To obtain beautiful ebru results, one needs to have a light hand, refined taste, and an open mind to the unexpected patterns forming on the water. Patience and a good knowledge of traditional culture are characteristic of ebru masters. After the 1550’s, booklovers in Europe prized ebru, which came to be known as ‘Turkish papers’. Many specimens in their collections and in the several album amicorum books are visible today in various museums. Also, early texts dealing with ebru, such as “Discourse on decorating paper in the Turkish manner”, published in 1664 by Athanasius Kircher in Rome, helped to disseminate the knowledge of this kind of marbling art. There is agreement amongst scholars that the so-called Turkish Papers played a colourful influence on the book arts in Europe. Ebru Marbling is a unique art which many painting and design lovers like to do in their spare time and especially demonstrate to their friends on different occasions. Nevertheless, this spectacular piece of art does have many applications in daily life where it is used to enhance the decor and look of the goods. This patterned paper is extensively used in the binding of books and within the calligraphic panels in Turkey. In addition to this, “ebru” works are often framed as pictures and used all over the world as a piece of decoration. Other than paper work, the pattern is often designed on leather, glass, cloth, furniture, book covers, notebooks, invitations, and many other areas to reflect the unique glamour of this art. Our Professional Marbling Set is Available for Purchase in Our Gallery. We can also mail it all over the world. Set Cost : 135 Euro + Shipping. Gum Tragacant is obtained from trunk of a thorny plant growing naturally in Anatolian, Persian and Turkestan mountians and called “gaven”. The sap coming out of scratches made on the branches dries up later and solidifies in bone white colored pieces. It is dropped in water with very low hardness at the rate of 20-40 grams/3 litres and kept for two days.The gum having dissolved completely is filtered through a cloth bag and poured into the basin. It should have a dentisty of buttermilk.Gum tragacanth is widely used as herbal medicene(in throat and stomach diseases) in cosmetic and textile industry. Dye are “mineral dyes” as it is called in clasiccal method obtained from natural metal oxides. Turkish is a very rich country in respect of such natural dyes.Any kind of earth may be first translated into mud then filtered and crushed to from a dye. Painthbrushes; are made of horsehair bound around a rosetree stick, in a manner to from a circumference with hollow centre.Rosetree is preferred because it prevents mould. Brushes of different thickness and length enable dye application and dye control. Basin is made of wood or metal of 4-6 cm. depth an about some milimeter larger than the paper size (to offset the dilatation of paper when wet). Usual paper zizes are 35X50 cm. or 25X35 cm. Water; preferably withouth hardness.The ideal is distilled water. In older times rainwater was favorite but because of acide rain in our times it is no longer advisable. Paper: The ideal paper is the one handmade and having a high absorbtion capacity and acid-free. On account of its rarity and high cost we don’t advise it to begginers. Instead, any kind of non glossy paper may be used. In order to increasethe absorbtion capaticy and to fix the dye on it(more durable) and alumina solution may be applied on the paper surface. Thus dyes are made more easy to fix. 1. to ensure surface tension, dye spreading over the water surface otherwice dyes sink. 2. to prevent mixture of dyes. For instance when blue yellow are simultaneously applied and mixed up as much as possible never green comes out. 3. to assist dye fixation on the paper. 4. to give different shades of the same color and different size of patterns. 1- Battal – Stone: The oldest recorded style in Ebru. It is the base of all forms in paper marbling art. The paints stay as they drop off the brush no other effect is given. 2- Gel Git – Tidal : After having a battal base, it is formed by zigzag movements parallel to the sides of the basin. This tidal movement is sometimes applied diagonally as well. 3- Şal – Shawl : Formed by an evenly spreading of two or three ‘S’ shapes on a tidal ebru in the opposite direction of the last tidal move. 4- Bülbül Yuvası – Nightingale Nest : Formed by inside to outside spiral movements next to each other on a battal ebru. 5- Taraklı – Combed : A vertically made tidal ebru is combed in the opposite direction of the last tidal movement. 6- Kumlu – Sandy : Formed by continuously dropping of low density paint on an extremely thickened basin and letting the work sit for a long time. The surface tension is high in an extremely thickened basin. The low-density paint is going to be pressured under the high tension of the surface and after a while crack and form the sandy or bony ebru. 7- Hafif – Light : Paints are diluted more than in other ebru types. Light ebru is usually used as a base to perform calligraphy. 8- Hatip – Orator : Motifs are formed by giving movement effects to the paints that are distributed evenly within each other on the surface. Colors at the background are light, motif colors are intense. 9- Dalgalı – Wavy : When the paper is moved back and forth during the marbling, the result will appear as waves on the paper. The paper can be folded, (creases point the surface) when each move contacts with a crease it will change direction and will form the waves on the paper. Waves can be formed only if the movement has a regular rhythm. 10- Neftli Battal –Turpentine: This is obtained by sprinkling paints with some added drops of Turpentine (preferably pine turpentine) onto a ‘Battal’ background. It gives a wavy appearance. 11- Somaki Battal – Porphyry: Generally made with two color. More gall is added to the second color, which squeezes the first color and creates thin veins, like marble. 12 – Serpmeli Battal – Sprayed: After any well known “Battal marbling” is made, a second color, in contrast to the background, is sprinkled is small droplets. The paint in the brush is squeezes out carefully, and some people use a special brush for sprinkling. This sprinkling may be formed in ‘Gel-Git’ – ‘ Bülbül Yuvası’ or other patterns. 13- Ak Kase – Stenciled Marbling: This is a pattern obtained by making several imprints on the same background, and popular with calligraphers. The base consist of a ‘light marbling upon which the script is written using a special fluid prepared with gum Arabic applied with a red pen or brush. Thus the surface of the light marbling is covered (insulated) by the gum Arabic. After drying, another design using darker colors is applied on the same paper: the parts covered with gum Arabic will resist the second coat and will therefore display the script. The same technique may be applied using a stencil, and other substances can be used instead of gum Arabic, for example heavy gum tragacanth, silicone, several transparent glues etc. 14- Yazılı Ebru – Script Marbling: This is obtained by writing the script with gum Arabic and then marbling the same paper, or vice versa (Leaving the script blank and applying the gum Arabic as background). Writing with gum Arabic (Transparent ink) demands particular skill, because it is very difficult to make correction. 1- Fantazi – Fantasy 2- Kedi Gözü – Cat Eye 3- Dalgalı – Waved C- Flowered Ebru;Forms of flower motifs are applied on battal ebru. Application process is quite different from oil painting. Ebru master has to form the flowers and get the image on paper rapidly, before the paints on the water start cracking. Therefore this art should not be compared with the art of painting. 1- Lale – Tulip 2- Karanfil – Carnation 3- Sümbül – Hyacinth 4- Demet Çiçek – Flower bunch 5- Renkli Menekşeler – Multicolored violet 6- Papatya – Camomile / Daisy 7- Gelincik – Poppy 8- Gül – Rose 9- Buket – Bouquet • All these different types of Ebru have their own combinations of dyes, drawing techniques and have different levels of difficulty in preparation and different methods, in general, but the equipment used is almost the same for many of these types. Through practice and passion, candidates can learn all of them and enjoy the perfection of this beautiful art. Marbling is similar to cooking; it is impossible to give the exact recipe. Everyone has his own mixture of colors and patterns and wishes to reflect to own world. Marbling results by the simultaneous operation of many accurate balances. Purity and application rules must be streaktly observed. The density of the gummed water and the relationships between the water and the dye, the dye and the tensioning agent (gall), the quantity of gall in the dye are all very important. It may take some time to establish such a delicate balance. But was everything is ready marbling is easily and quickly performed. Yet this property of the marbling makes it very suitable for a “theraphy”. Dyes are spopotted on the surface of the water by means of paintbrushes and according to quantities and colors desired. Dyes should not be too concentrated. Concentric, superposed drops thus applied form a pattern called “Battal”. This pattern is the origin of almost all others. Now if this basic pattern is handled by parellel lines made by a thin pencil or chip moved back and forth you obtain “the back-and-forth”. If this design is crossed out by means of a comb a “combed-pattern” is obtained. In case the “back-and-forth” is diagonally crossed again, it becomes “shawl” sample. Combed marbling may be made into back-and-forth or shawl design. When a convolute line is applied from the outer circumference towards the centre you obtain a “nightingale nest”. In the event small colorfull dots are spotted on the back-and-forth or shawl design you get the “sprinkled marbling”. If, instead, you apply larger dots (which means with higher rate of gall contents) you obtain the “prophyry marble” which resemble most to marble. Nonetheless above patterns may be divesified by selecting one of the above as a basis and making concentric drops of different colors. Mehmet Efendi (the orator of Saint Sophia, deceased in 1973) first formed flower and other patterns, wich were subsequenly called the “Orator pattern” (Hatip ebrusu). Later on these patterns developed into flower shaped marblings. The sheet of paper is lard from one side onto any of above designs prepared on the gummed water in the basin. Now this processing makes the dye fixed on the paper. The paper is then careflly lifted off the basin without stripping too much the gum off the surface. In classic Turkish marbling the paper taken out of the basin is not washed off. The thin layer of gum remaining on the surface forms a protective (fixing) coat. The paper is laid on a flat surface and let to dry up. Presuming every material is made ready, the translation of the patterns made on the surface water is accomplisheed within 3-5 minutes or at most, 15 minutes. This infinity of colors and shapes quickly formed makes the marbling amazing at and fascinates the spectator (if any). It makes eveything forgotten. One evening the late calligraphy and marbling master, Necmetting Okyay started to make marbling.Some time later he heard a sound coming from the street and supposed that it was the voice of a street seller making business late in the night: to his surprise this was the müezzin performing the morning player call. There are seven items that are necessary for marbling. 1. Gum tragacanth: This is a white substance obtained from the plants of the Astragalus family common to Turkey, Iran, the Caucasus region and Afghanistan. This is a glue-like substance that gives the water used a degree of viscosity. To prepare it, tragacanth is soaked for two days in water. The preparation is filtered to ensure there are no undissolved particles remaining. The strained liquid is then put into the shallow vessel used for the dyeing process. 2. Dyes: Only natural dyes are used in ebru. These earth-based dyes, containing metal oxides, are crushed with a pestle on a marble slab until reduced to a fine powder. The dyes are placed in separate glass jars and mixed with a small amount of water. 3. Brushes: The brushes that are traditionally used in ebru are made from horsehair and rose branches. The brushes are made in different thicknesses and lengths for easier control of the paint. 4. Basin: The liquid used for ebru is placed in a basin that is the same size as the paper being used. Traditionally the basins were made of unknotted pine, but now they are made of many types of wood, as well as metal. These are shallow containers, only 4-6 centimeters in depth. 5. Water: The water used must have very low levels of calcium, chlorine and lime. Distilled water is ideal for ebru. 6. Paper: The paper used must not be lacquered or polished in any way. The best paper is handmade, acid-free and absorbent. 7. Gall: This is the key ingredient to ebru. Ox bile is boiled to prevent spoiling, and it is used to lower the viscosity of the base liquid and enable the paint to disperse evenly across the water. Without gall, the colors simply sink to the bottom of the basin. It prevents the dyes from bleeding into each other, and it helps the dyes adhere to the paper. The gall is also used by the artist to mix different shades of the same color. In addition to the basic method of marbling an entire piece of paper, there is written marbling. This particular style of ebru combines marbling and calligraphy. On a blank piece of paper, the calligrapher will write out the work using a reed pen that is dipped in glue instead of dye. The writing is invisible when dried, and when immersed in the liquid in the basin, the remaining paper will absorb the dyes, leaving the writing to stand out without being dyed. Two-toned marbling, or akkase ebru, is made using a technique similar to written marbling. Sections of a lightly colored marbled paper are coated with glue and the paper is them immersed into the basin containing darker colors. The lighter parts that have glue on them will remain unchanged, while the part without glue will absorb the darker colors. 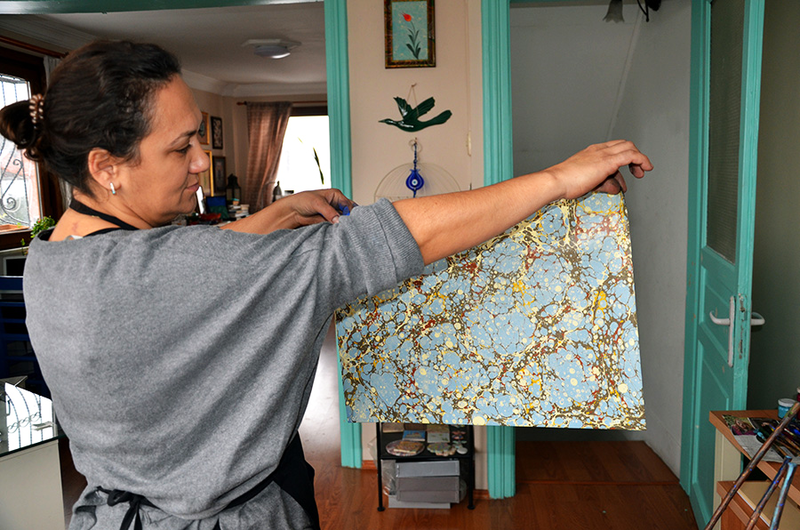 Ebru artists rarely sign their artwork, so it is often impossible to know who created a piece. The collection at Topkapı Palace holds several pieces of ebru that date back to the early 16th century. Over the centuries, Turkey remained the center for the art of ebru. 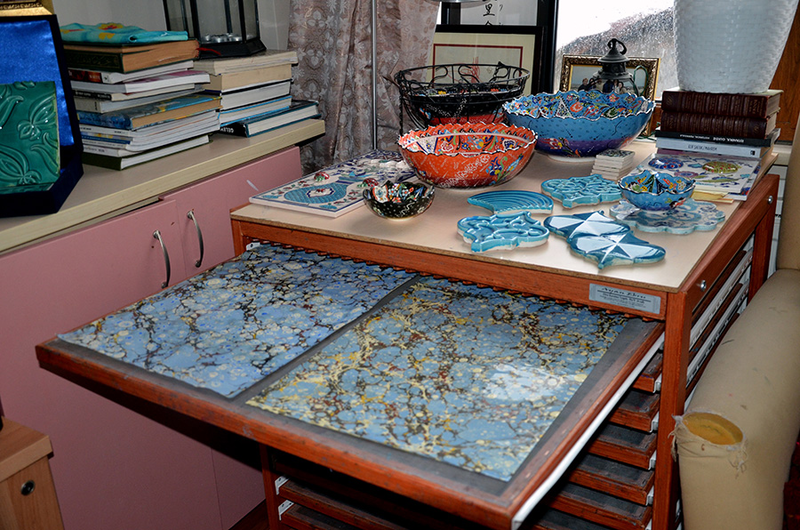 Until the 1920s, ebru masters had workshops in İstanbul’s Beyazit neighborhood. Work was produced there for both the Turkish and European markets. MARBLING APPLIED TO PAPER PATTERNS Classical Types of Ebru; 1- Battal – Stone: The oldest recorded style in Ebru. It is the base of all forms in paper marbling art. The paints stay as they drop off the brush no other effect is given. 2- Gel Git – Tidal : After having a battal base, it is formed by zigzag movements parallel to the sides of the basin. This tidal movement is sometimes applied diagonally as well. 3- Şal – Shawl : Formed by an evenly spreading of two or three ‘S’ shapes on a tidal ebru in the opposite direction of the last tidal move. 4- Bülbül Yuvası – Nightingale Nest : Formed by inside to outside spiral movements next to each other on a battal ebru. 5- Taraklı – Combed : A vertically made tidal ebru is combed in the opposite direction of the last tidal movement. 6- Kumlu – Sandy : Formed by continuously dropping of low density paint on an extremely thickened basin and letting the work sit for a long time. The surface tension is high in an extremely thickened basin. The low-density paint is going to be pressured under the high tension of the surface and after a while crack and form the sandy or bony ebru. 7- Hafif – Light : Paints are diluted more than in other ebru types. Light ebru is usually used as a base to perform calligraphy. 8- Hatip – Orator : Motifs are formed by giving movement effects to the paints that are distributed evenly within each other on the surface. Colors at the background are light, motif colors are intense. 9- Dalgalı – Wavy : When the paper is moved back and forth during the marbling, the result will appear as waves on the paper. The paper can be folded, (creases point the surface) when each move contacts with a crease it will change direction and will form the waves on the paper. Waves can be formed only if the movement has a regular rhythm. 10- Neftli Battal –Turpentine: This is obtained by sprinkling paints with some added drops of Turpentine (preferably pine turpentine) onto a ‘Battal’ background. It gives a wavy appearance. 11- Somaki Battal – Porphyry: Generally made with two color. More gall is added to the second color, which squeezes the first color and creates thin veins, like marble. 12 – Serpmeli Battal – Sprayed: After any well known “Battal marbling” is made, a second color, in contrast to the background, is sprinkled is small droplets. The paint in the brush is squeezes out carefully, and some people use a special brush for sprinkling. This sprinkling may be formed in ‘Gel-Git’ – ‘ Bülbül Yuvası’ or other patterns. 13- Ak Kase – Stenciled Marbling: This is a pattern obtained by making several imprints on the same background, and popular with calligraphers. The base consist of a ‘light marbling upon which the script is written using a special fluid prepared with gum Arabic applied with a red pen or brush. Thus the surface of the light marbling is covered (insulated) by the gum Arabic. After drying, another design using darker colors is applied on the same paper: the parts covered with gum Arabic will resist the second coat and will therefore display the script. The same technique may be applied using a stencil, and other substances can be used instead of gum Arabic, for example heavy gum tragacanth, silicone, several transparent glues etc. 14- Yazılı Ebru – Script Marbling: This is obtained by writing the script with gum Arabic and then marbling the same paper, or vice versa (Leaving the script blank and applying the gum Arabic as background). Writing with gum Arabic (Transparent ink) demands particular skill, because it is very difficult to make correction. Modern Types of Ebru; 1- Fantazi – Fantasy 2- Kedi Gözü – Cat Eye 3- Dalgalı – Waved C- Flowered Ebru;Forms of flower motifs are applied on battal ebru. Application process is quite different from oil painting. Ebru master has to form the flowers and get the image on paper rapidly, before the paints on the water start cracking. Therefore this art should not be compared with the art of painting. 1- Lale – Tulip 2- Karanfil – Carnation 3- Sümbül – Hyacinth 4- Demet Çiçek – Flower bunch 5- Renkli Menekşeler – Multicolored violet 6- Papatya – Camomile / Daisy 7- Gelincik – Poppy 8- Gül – Rose 9- Buket – Bouquet • All these different types of Ebru have their own combinations of dyes, drawing techniques and have different levels of difficulty in preparation and different methods, in general, but the equipment used is almost the same for many of these types. Through practice and passion, candidates can learn all of them and enjoy the perfection of this beautiful art. Marbling is similar to cooking; it is impossible to give the exact recipe. Everyone has his own mixture of colors and patterns and wishes to reflect to own world. Marbling results by the simultaneous operation of many accurate balances. Purity and application rules must be streaktly observed. The density of the gummed water and the relationships between the water and the dye, the dye and the tensioning agent (gall), the quantity of gall in the dye are all very important. It may take some time to establish such a delicate balance. But was everything is ready marbling is easily and quickly performed. Yet this property of the marbling makes it very suitable for a “theraphy”. Dyes are spopotted on the surface of the water by means of paintbrushes and according to quantities and colors desired. Dyes should not be too concentrated. Concentric, superposed drops thus applied form a pattern called “Battal”. This pattern is the origin of almost all others. Now if this basic pattern is handled by parellel lines made by a thin pencil or chip moved back and forth you obtain “the back-and-forth”. If this design is crossed out by means of a comb a “combed-pattern” is obtained. In case the “back-and-forth” is diagonally crossed again, it becomes “shawl” sample. Combed marbling may be made into back-and-forth or shawl design. When a convolute line is applied from the outer circumference towards the centre you obtain a “nightingale nest”. In the event small colorfull dots are spotted on the back-and-forth or shawl design you get the “sprinkled marbling”. If, instead, you apply larger dots (which means with higher rate of gall contents) you obtain the “prophyry marble” which resemble most to marble. Nonetheless above patterns may be divesified by selecting one of the above as a basis and making concentric drops of different colors. Mehmet Efendi (the orator of Saint Sophia, deceased in 1973) first formed flower and other patterns, wich were subsequenly called the “Orator pattern” (Hatip ebrusu). Later on these patterns developed into flower shaped marblings. The sheet of paper is lard from one side onto any of above designs prepared on the gummed water in the basin. Now this processing makes the dye fixed on the paper. The paper is then careflly lifted off the basin without stripping too much the gum off the surface. In classic Turkish marbling the paper taken out of the basin is not washed off. The thin layer of gum remaining on the surface forms a protective (fixing) coat. The paper is laid on a flat surface and let to dry up. Presuming every material is made ready, the translation of the patterns made on the surface water is accomplisheed within 3-5 minutes or at most, 15 minutes. This infinity of colors and shapes quickly formed makes the marbling amazing at and fascinates the spectator (if any). It makes eveything forgotten. One evening the late calligraphy and marbling master, Necmetting Okyay started to make marbling.Some time later he heard a sound coming from the street and supposed that it was the voice of a street seller making business late in the night: to his surprise this was the müezzin performing the morning player call.